We welcome to our family Deryl Edward who arrived March 16 at 7 lbs. 10-1/2 ozs. Dakota finally has his brother! Sisters are Kateri, Becky and Janelle. Special thanks to Grandma Jig for her "taxi" service and support. 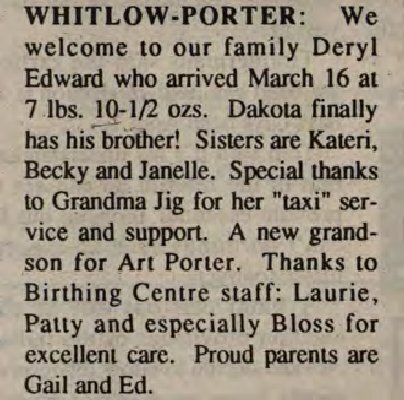 A new grandson for Art Porter. 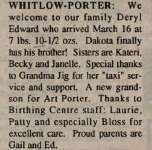 Thanks to Birthing Centre staff: Laurie, Patty and especially Bloss for excellent care. Proud parents are Gail and Ed.